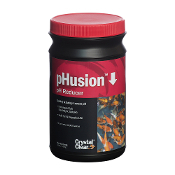 CrystalClear pHusion fuses pH lowering qualities with natural electrolytic supplements to safely lower pH levels in pond water at no more than 0.2 points per application. 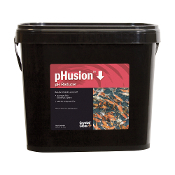 CrystalClear pHusion also adds much needed electrolytes to help fish maintain a strong slime coat and healthy appearance. When used as directed, CrystalClear pHGuard will stabilize pond water pH and maintain buffering capacity as safe levels between 80-240 ppm. 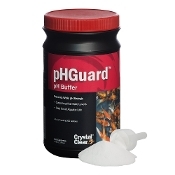 CrystalClear pHGuard will help prevent wide pH swings which are typical from morning to night. CrystalClear pHGuard makes pond water safe for fish and plants and helps keep water balanced in the hot summer months. Keeping a properly buffered system is essential for the completion of the nitrification process, which allows harmful ammonia to be converted to nitrite and then to nitrate.